I developed this routine after concluding that Vernon's Travelers, while in many ways a brilliant effect, was fundamentally flawed. The aces travel from the deck to the pockets. 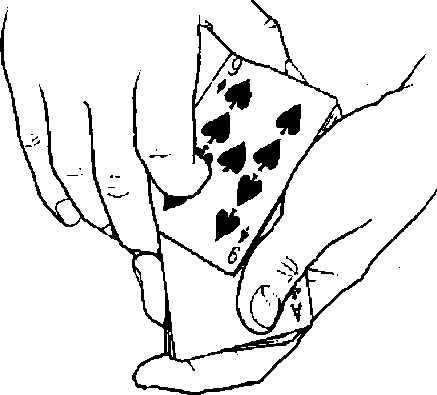 But, in order for this to happen, the hands have to repeatedly travel back and forth between the deck and the pockets. The fact that the deck is continually shifted from hand to hand only serves to draw attention to this fact. Is it really that difficult for the audience to sense what the delivery system must be for getting the cards from the deck to the pocket? The lact that he can't catch the performer doing it doesn't mean that a perceptive spectator won't intuit what must be happening. Misdirection and skill may cover the technique, but they can't hide the outward actions that ultimately reveal the method. In the Hitchcock Travelers, it matters far less to the audience what you do with the deck because the aces aren't traveling irom the deck to the pockets; they're traveling from the table to the pockets. The selected-cards feature provides a suitable dramatic punctuation at the end.